Imani is adopted by a Jewish family. Now that she’s turning 13, she knows exactly what she wants as her big bat mitzvah gift: to find her birth parents. She loves her family and her Jewish community in Baltimore, but she has always wondered where she came from, especially since she’s black and almost everyone she knows is white. When her mom’s grandmother–Imani’s great-grandma Anna–passes away, Imani discovers an old journal among her books. It’s Anna’s diary from 1941, the year she was twelve and fled Nazi-occupied Luxembourg alone, sent by her parents to seek refuge in Brooklyn, New York. Imani keeps the diary a secret for a while, only sharing it with her best friend, Madeline. Anna’s diary chronicles her escape from Holocaust-era Europe and her journey to America and her new life with a Jewish adoptive family. She continues to write to her sister Belle about the tall New York sky scrapers, shopping in supermarkets, eating Chinese food, modeling fur coats, and playing Chinese checkers, until news about her family stops. She fears the worst and puts down her pen. Imani decides to make Anna’s story her bat mitzvah research project. She uncovers some important information about the war and Luxembourg. As Imani reads Anna’s diary, she begins to see her own family and her place in it in a new way. The author skillfully weaves two stories, one from the present and another from the past, using characters that you will feel like you know intimately. This is a very different holocaust story because it focuses on the identity of Jewish and African-American girls (70 years a part) and their search for self, something that readers will find relevant. The setting, the unforgettable characters, and the plot create an engaging reading experience. The ending is unexpected and very satisfying. You learn about Anna Kirsch and the painful decision her family makes in deciding which of their seven children to smuggle to America as the Nazi’s begin to occupy Luxembourg. Anna is selected and separated from her identical twin sister, Belle, the other half of her heart. On the ship she begins to write Belle daily letters daily chronicling her journey so that she keeps their connection alive. Anna lives with loving strangers, Hannah and Max, a Jewish family who open their hearts and home to her. Anna is essentially adopted, like Imani. She continues to write to Belle about her adventures until news about her family stops. My children are adopted, each responding differently like Imani and her adopted El Salvadoran brother. Like Imani, my daughter had so many questions about her past. What were her ethnic roots? Who did she look like? Why was she adopted? Like Imani’s family, we ran a genetic DNA test for our daughter so she had a sense of her heritage. This eventually led to her finding two biological sisters this past year. Now she has answers and it has brought her peace as an adult. We need more MG and YA books for adopted children who are trying to figure out who they are and need to see themselves in stories. Elissa Brent Weismann’s novel is a captivating story that is a departure from her humorous Nerd Camp series. Her website includes teacher resources and curriculum for all of her books. Synopsis: Eleven-year-old Kara never met her birth mother. Abandoned as an infant in Tianjin, she was born with only two fingers on her right hand. She was taken into the home of an elderly American couple living in China. Her parents never tell authorities about finding Kara or try to formally adopt her, which leaves Kara without an identify. When papa’s teaching job is finished he returns to Montana. Her mama remains because she can’t bear to part with Kara. Much of Kara’s life is isolated to keep her safe. She has a daily routine that includes study, but doesn’t attend a Chinese school or have any friends. Her English is excellent, but she can’t read or write in Chinese. When her loud and overbearing American half-sister Jody comes for a visit and ends up in the hospital, the authorities are suspicious. They discover her mama’s visa expired and Kara’s is taken to an orphanage, where she is put up for adoption. This is a complex and multi-layered story where Kara is the innocent victim of secrecy and poor choices made by her foster parents. A.L. Sonnichsen has written a deeply moving story about Kara learning to find her voice and discovering that love knows no boundaries. It is an emotional read. Free verse is the perfect medium to share this story because it is told in Kara’s voice, which shows her confusion, desperation and loss. The language is beautifully executed, lyrical and carefully crafted with skill and a lot of depth. The story is beautifully paced and a quick read. Amy June Bates pen and ink illustrations add a creative flare to the spare text. The plot is courageous and complicated. A.L. Sonnichsen delves deeply into the loneliness of a pre-teen trying to make sense of her mother’s secretive behavior. When the walls crumble around Kara, she has to find her way forward. She begins to find her strength at the orphanage where she helps care for the abandoned children with disabilities. She learns to build trust with some compassionate souls who try to make things right for her. I enjoyed learning that the author grew up in Hong Kong and spent eight years there as an adult, where she was visited many local orphanages. Her passion for the abandoned children became the inspiration for the story. Chinese law is complicated and it took the author and her husband seven years to adopt their daughter from a Chinese orphanage. During that time she worked with an organization that worked to improve conditions in orphanages. Resources: There is a beautiful Author’s Note that talks about her personal experiences in China, as well as the “fall-out” from China’s one-child policy. There is a Reading Group Guide at the end, which would be perfect for classroom discussions. Visit the author at her website. Synopsis: Michaela DePrince was born in 1995 in war-torn Sierra Leone and named Mabinty Bangura. She was born with Vitiligo, a medical condition that causes blotchy spots on her skin. To the villagers she was a curse and called a spotted leopard. However, she had loving parent who taught her to read, write and speak four different languages. When the rebels killed her father and her mother died, her uncle sold her to an orphanage, where she became #27 . She was starved, abused, and faced incredible dangers from the rebels. One day she found a picture of a ballerina in a magazine which affected her life forever. At four, she and her best friend Mia were adopted by an American family. The family encouraged her love of dancing and made it possible for her to study at the Rock School for Dance Education and the Jacqueline Kennedy Onassis School at the American Ballet Theatre. She is now a member of the world-famous Dutch National Ballet in Amsterdam. The heart of this story is the strong mother/daughter relationship which translates into a remarkable collaboration and a gripping memoir about Michaela’s journey from Mabinty Bangura, a war orphan in Sierra Leone, to a 17-year-old professional ballerina. The story’s real strength lies in Michaela’s lifelong passion to become a ballerina and her remarkable determination to break through racial barriers to dance classical and neo-classical ballet with a professional company. She shows great discipline and sacrifice to be the best. The narrative about Michaela’s journey is compelling and unforgettable. Taking Flight is written in such a manner that young readers would be able to handle the details of war and be interested in learning some history about West Africa. The story is simply told in prose, but is filled with satisfying detail. The pacing is perfect and the book is a page-turner. This book is ideal for any reader, but young black ballet dancers will especially find hope in Michaela’s story. There is a section of photos in the middle of the book documenting her life — from the African orphanage, her new home and family, to her ballet training and dancing. These photos will help young readers better grasp her life. 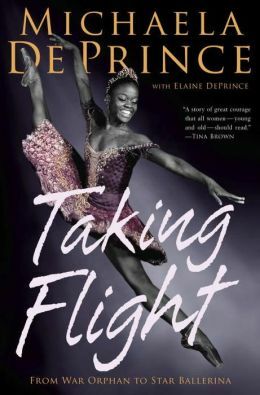 Resources: Michaela DePrince starred in the ballet documentary First Position, which can be found in many libraries. She hesitated to be featured but decided that it was something that she could do to help African-American children who dream of dancing. She felt she had a responsibility to write a memoir and share the “hardy dose of hope” she had been blessed with. Visit Michaela DePrince at her website. Synopsis: Eleven-year-old Billy Ray is unhappy because his father has left home and the things they planned to do together aren’t going to happen. His mother is pregnant, and works a lot. A watchful older neighbor is a great cook, invites Billy to visit daily and treats him to a good meal. School is hard for Billy because he has Fetal Alcoholism Spectrum Disorder (FASD) and he has many challenges. He can’t sit still without falling out of a chair. He is unable to focus on schoolwork. Words get jumbled in his mind and he can’t read. Billy is a target for bullies. He wonders what’s wrong with him. If only he can enter the talent show at the local park and impress his father with the 21 tricks he’s mastered with his Typhoon yo-yo. Will his father show? Billy needs a friend and discovers that one of his classmates, an adopted Romanian girl, lives across the street from him. Natasha never talks and Billy occasionally gets her to smile. An unlikely friendship develops between the Billy and Natasha and they share secrets. Billy discovers Natasha is keeping a moon journal. Every day she draws a picture of the phase of the moon and writes. He feels her sadness and knows there is a hidden story she’s trying to tell. His friendship with Natasha show’s Billy’s many abilities — he’s compassionate, caring, and helps Natasha when no one else can. Even though he has his heart set on winning that talent contest, Billy discovers what is most important in his life. Why I like this book: Beverley Brenna has chosen complex topics and presented them in a very positive manner, focusing on abilities over challenges. Brenna writes believable characters that stay with you long after you put the book down. You don’t realize that Billy has FASD right away, but you experience the roller coaster he rides daily. FASD is revealed when he overhears his parents talking about “the new baby won’t be like Billy.” This comment upsets and confuses Billy until he talks with his mother and learns about her drinking problem during her pregnancy with him. Brenna carefully handles this topic with concern for Billy and his mother. Brenna also tackles the subject of Romanian adoptions and the difficult adjustments for the children in their new homes in Canada and America. This is an excellent book for kids with FASD to read so they can better understand themselves through Billy. It’s also a good book for the classroom. 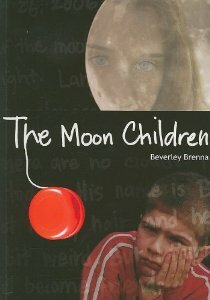 Resources: Beverley Brenna has a teacher’s guide for The Moon Children. Visit her website to view all the books she’s authored. And, click here for information on the National Organization on Fetal Alcohol Syndrome (NOFAS). The website provides a wealth of information for those interested. Opening/Synopsis: “Oh No! Green Bean thought. Maybe I don’t belong in this family. I am green. 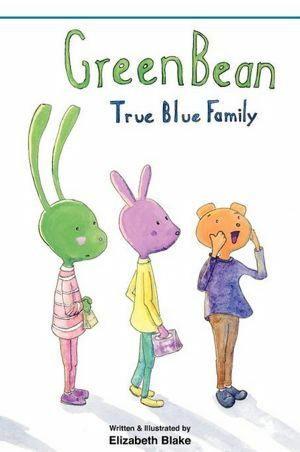 They are blue.” GreenBean one days realizes that she doesn’t look like the other members of her family. She has long ears and they have short ears. She frets about all the differences and compares herself to her friend Anna who is the same color as her family. It isn’t until GreenBean’s blind brother is surprised by her statement and offers her a new perspective of family. GreenBean begins to see the diversity among her friends. And, she learns that being loved and accepted by her blue family is what counts. What I like about this book: This is the first book written and illustrated by Elizabeth Blake. The language is simply written as are her bold and colorful illustrations. Both my children are adopted and struggled with identity issues and feeling different. I would have welcomed her book. In today’s world, there are many different kinds of families — divorced, single-parent, foster, mixed multicultural and ethnic, and gay families. Blake’s excellent book helps children understand diversity is part of who we are globally. Otherwise we’d be pretty boring. Blake’s credits her blind brother “who taught her that sight is not necessary for insight.” He has been inspiration to her in learning about uniqueness and differences. Visit Elizabeth Blake at her website. This book has been provided to me free of charge by the author in exchange for an honest review of the work. Opening/Synopsis: “When Soo Min came from Korea to her new home in America, she spoke no English. Her new family knew just a few Korean words. Mok-da – eat. Chim-dae – bed. Bahp – rice. Jip – house. In the first few days, Soo Min quickly taught them more words: Anyah – no! when she didn’t want to go to bed. Ah-po – hurt, when she scraped her knee. Gom – teddy bear, which she carried in the hood of her jacket. Po-po – kiss, a gift she gave her parents. Best of all was Goyangi — the cat.” This is a very sweet story about Soo Min and the adjustments she has to make coming to live with her new parents. Soo Min loved Goyangi right away and followed the cat everywhere. Goyangi curls up on her bed at night and helps to lessen her anxiety. Soo Min is not afraid when Goyangi is with her. It is through her relationship with Goyangi, that Soo Min finds her place with her new parents and in her new home. Why I like this book: I am partial to books for kids who have been adopted from other countries. We adopted our son from India in 1985. It is such a learning curve for all involved. Like Soo Min, our son attached himself to our dogs. And, I remember how we learned more from him, as he pointed out things in his native tongue, Tamil. Christine McDonnell has done a lovely job of incorporating Korean words into the entire book, so that children will learn a little Korean. The lovely illustrations, by Steve Johnson & Lou Fancher, are warm collages that highlight the colorful textiles that decorate the walls and furniture throughout the pages, lending an Eastern-western look. Activities: I found the most useful activities for parents adopting older children at the Administrations for Children and Families website for foster and adoptive families. Creating a Life Book, is one good example. There are also support organizations for families who have done international adoptions.